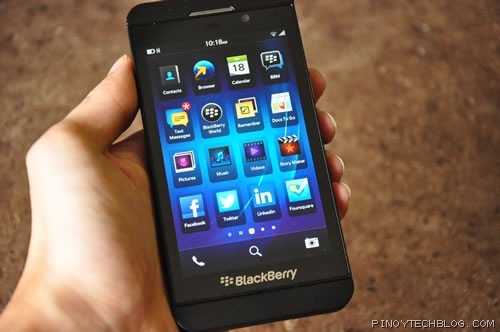 The BlackBerry Z10 is the first handset to use the new Blackberry 10 OS and is a fully touch-screen device. 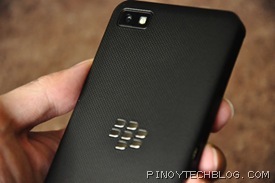 It can be viewed as the start of something new for BlackBerry. 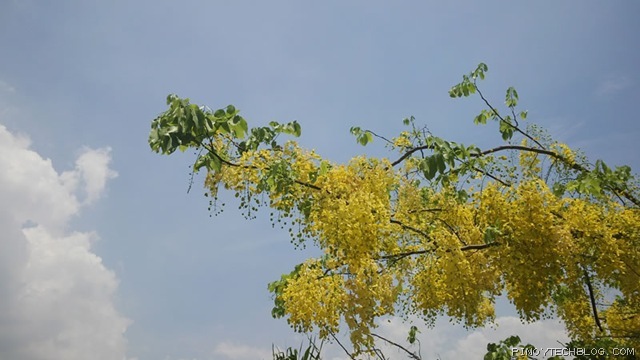 Something that they’re hoping can bring them back among the top of the smartphone market. Aside from having a full touch-screen, the Z10 now also runs on a regular data plan, removing the Blackberry Internet Service (BIS). Those who have always gotten confused with BIS versus the data plan won’t have to worry about understanding that thing anymore (I remember having to explain the difference of the data plan and the BIS to a lot of people in the past). 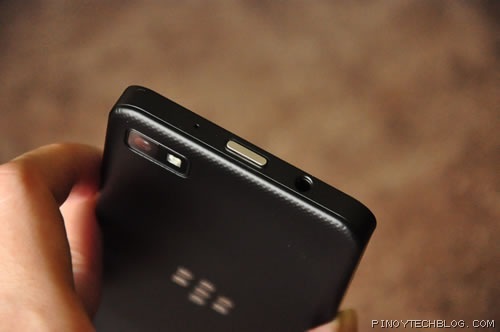 So let’s check out what this smartphone has to offer and if it can propel BlackBerry to the top. I like the way how this handset was very faithful to the design of the Playbook. It has the same subtle curved edge and a soft matte finish. 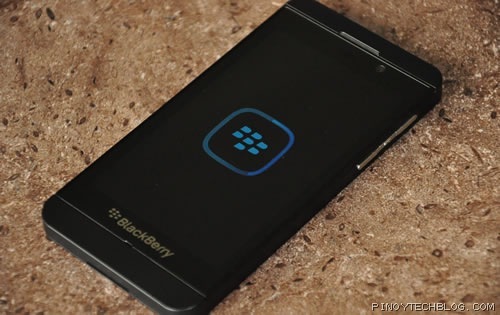 The back had the same rubbery texture as well, with a silver Blackberry emblem in the middle. It felt solid and light. One can easily grip it. It didn’t feel cheap at all and its lightness doesn’t feel fragile, unlike those other smartphones that I can’t seem to take seriously because of their plastic properties. 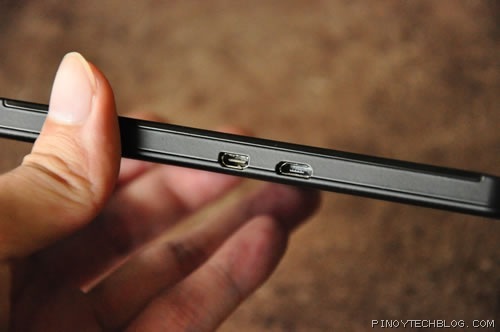 The top side of the unit has the Power/Lock button and the jack for earphones. The right side has the volume control buttons that also function as media play, pause, next, screenshot buttons. You can find the micro USB slot and the HDMI on the left side of the unit. You can swipe from all sides of the bezel. From the lock state, swiping from the bottom unlocks the phone. While your phone is unlocked, swiping from the bottom (or flicking up) will also bring you to your opened apps or multitask screen. 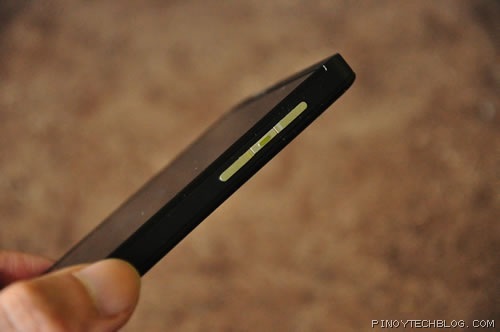 Swiping from the top reveals the settings and connectivity screen (you can also put the phone to sleep this way). Swiping from the left shows the Blackberry Hub, Notifications, BBM, Messages, your email accounts ““ all communication needs since it is after all a business phone. It is only after you surpass the multitask state that you can swipe to the right and see the menu for all your apps. This swipe-from-all-sides thing was a little hard for me to get used to and at times it was frustrating. I guess in time, you’ll eventually get the hang of it. If you’re a Playbook user, it’ll probably be easier to learn the gestures. The 4.2-inch LCD display was bright and very rich. It was beautiful to look at and to browse with, especially because the display is just the perfect size for me. It didn’t feel like it was cramped up nor was it too big to use. I can’t help but to remember the beautiful display of the Playbook. 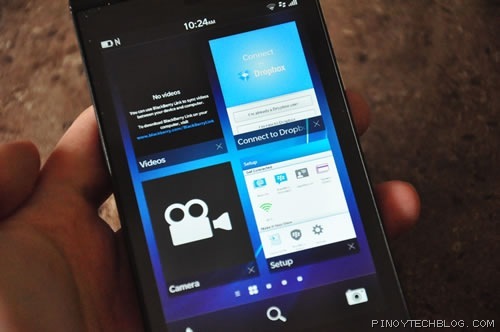 Watching HD videos is enjoyable with this smartphone. With HDMI, you can easily watch your videos (or give a presentation) on the big screen. I’m not much of a fan of the Blackberry not having a physical keyboard. 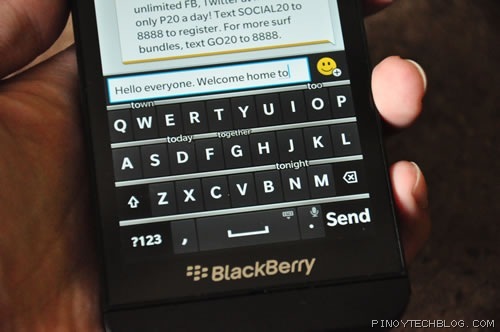 To me, a physical keyboard and the Blackberry just goes hand in hand. Since most of the smartphones nowadays are full-touch screen, I can’t say that the Blackberry Z10 did a bad job with the full-touch keyboard. The word suggestions were accurate and although at first I wasn’t too keen on the idea of having word suggestions (I’m not one for predictive text either), they turned out to be really handy and easy to use. Can’t say much about night shots though. I’m not too happy with the output with the flash on but that’s something common with other phones. 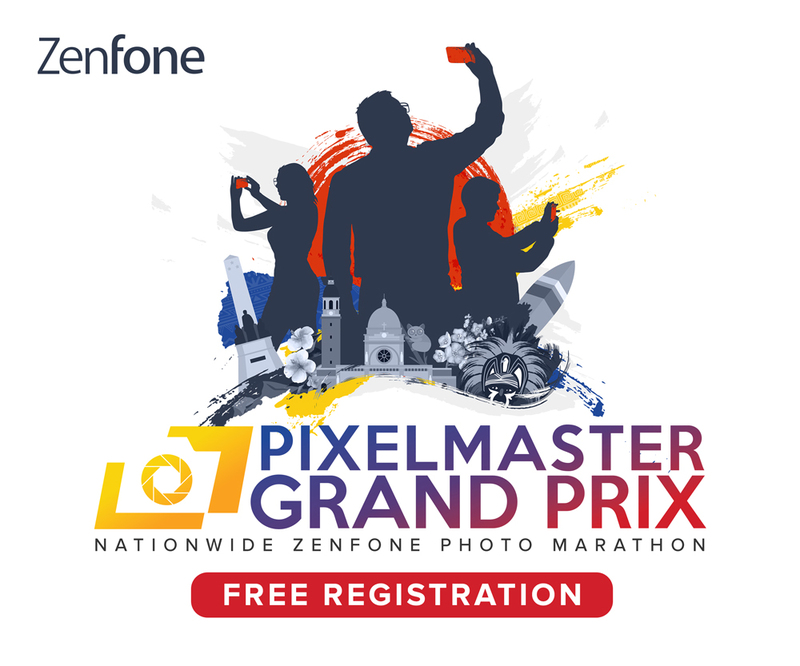 There’s also the TimeShift feature which lets you capture burst shots to produce the output that you want by combining elements from the different sequence of photos. This idea is not new as most flagship phones these days have something like it as a built-in camera feature. I owned a Blackberry Curve before and I was very impressed at the way BBM has this feature of backing up the contact list via email automatically so if I switch phones, all I had to do was to restore a backup from my email. I haven’t turned on the BIS of my old Blackberry Curve for a few months but I’m pretty sure that all of my three emails have a backup of my BBM contact list. So here I was looking forward to seeing my old contact list with the Z10, but for some reason, the smartphone couldn’t seem to detect any backups from all of my three email addresses. I don’t know if there are compatibility issues there but it sure was a let down. It’s only here in the Z10 that I encountered a 1:1 ratio with the Blackberry ID and the phone environment. Meaning, if I want to log out of the current Blackberry ID and change it to another, it would mean wiping the phone of all its contacts, calendar, apps, etc. Mind you, it takes a while to wipe the whole thing. I had to set the phone into Development mode for Sideloading (more on that later) and for some reason, that automatically set the phone to ask for a passcode when I locked the phone. When I needed to unlock it, it asked for a passcode that I didn’t know of (ulk), and failure to key in the passcode”¦ will result to a phone wipe. I wasn’t too happy with the idea that for me to access the memory/HDD of the unit, I would need to install the Blackberry Link first. What if I need to retrieve some files using another computer? I wish it was just plug-and-play. I think those who plan on purchasing a Blackberry should understand the concept of sideloading first before they make any decisions of purchasing one. 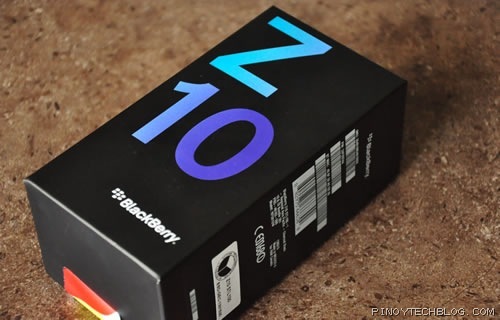 I heard of rumors before the release of the Z10 that it will allow Android apps to be installed into the smartphone (Ding ding ding! In simpler terms, this means I could have Instagram installed the Blackberry! Yes it is a big deal for me). 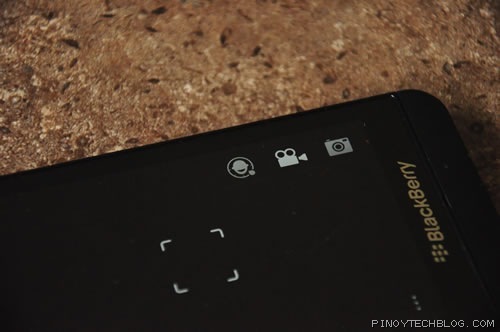 Sideloading is a way to install Android apps into the Blackberry. This is a big advantage especially when Blackberry doesn’t offer the official app in the Blackberry App World. 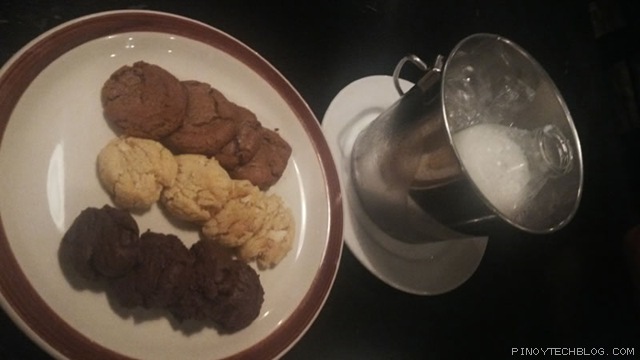 You can get some apps such as Instagram, Google Maps, Kindle, Gmail into your Blackberry through sideloading. What’s disappointing with this is that you will need a computer unit , download/install some software, and make sure you have an app compatible to the Blackberry 10 OS in order for it to work. Also, there’s a big chance that the available app for sideloading is not the latest app. This reminds me a lot of jailbreaking with IOS. You can see the step-by-step instructions to do sideloading here. 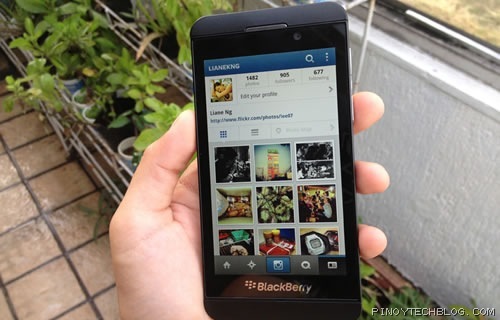 I am ashamed to say that a tech-enthusiast like me took almost 3 hours to get Instagram sideloaded into the Blackberry. 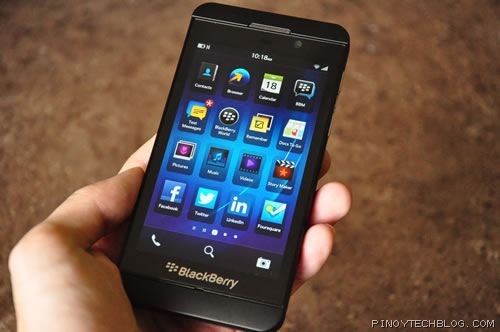 I’d like to welcome BlackBerry (not RIM anymore) back into the smartphone world. The Blackberry Z10 is a good release and I’m sure BBM fans are happy with this upgrade. This may not trump the leading smartphones out there ““ there are a number of things that can still be improved on, but it just means that BB is back and will give consumers another choice in the market for a good smartphone. Next order of business for them is to bring in more popular apps into BlackBerry App World. 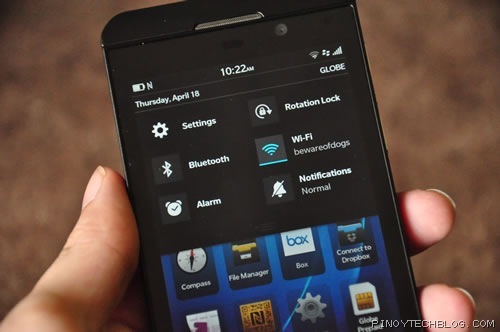 The BlackBerry Z10 retails for Php29,990 although it’s also available on a postpaid plan from Globe, Smart, and Sun. 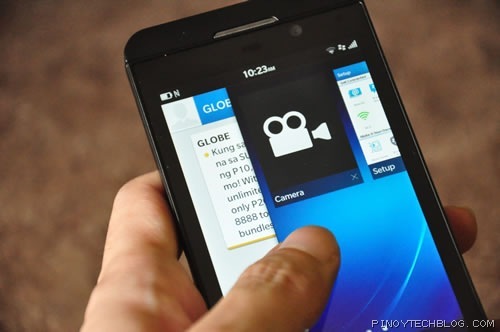 Globe has the advantage as they’re the only carrier that offers the LTE version of the Z10.